We ended the sampling year on a strong note! Thanks, as always, to all of the dedicated volunteers who sacrificed their mornings to help us take water samples all over the Watershed. The results came back from the lab and they were some of the best results we have had all year. 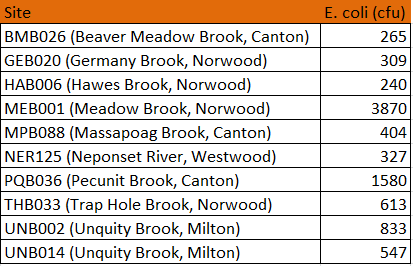 There were 10 out of 41 sites that had E. coli levels above the threshold that’s considered safe for swimming (anything over 235 cfus), however, out of those 10 sites, 7 of them had levels that are considered safe for boating (below 630 cfus). Map visualization of the E. coli data from the CWMN sites. Green sites are safe for swimming and boating, yellow sites are safe for boating, and red sites are not recommended for contact recreation. 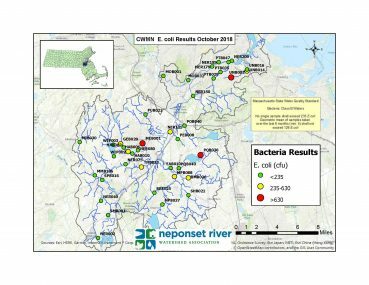 The 10 CWMN sites with the highest E. coli in October 2018. The dissolved oxygen (DO) data for the month of October was pretty good as well. Only three sites had DO levels below the limit that can cause stress to aquatic life (below 5 mg/l). Pequit Brook and Unquity Brook have had consistently low levels of DO in the past because the water is stagnant in areas upstream of where we sample from in these brooks, so the water is unable to hold lots of oxygen. Unlike these brooks, site NER125 on Dedham Street in Westwood doesn’t have stagnant water upstream. It is somewhat of a mystery as to why there has been low levels of DO recorded there in recent sampling years. It is possible that where we are recording dissolved oxygen, the probe is in a small inlet of the river where the water isn’t moving as fast as it is in the middle. 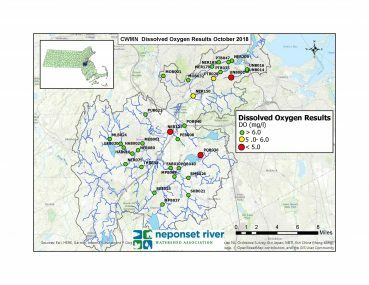 Ongoing construction in the area, as well as other factors, could be affecting the dissolved oxygen as well. We will continue to monitor this site to see if there are any clear indicators for what could be causing the low DO. Map visualization of the Dissolved Oxygen (DO) data from the CWMN sites. Green sites are considered safe for warm water and cold water fish, yellow sites are safe for warm water fish only, and red sites are not safe for aquatic life. 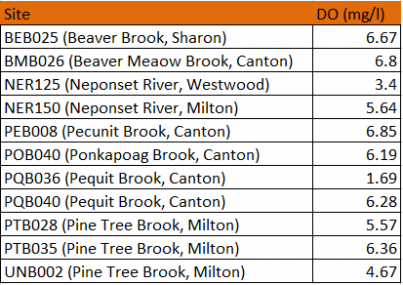 The 11 CWMN sites with the lowest Dissolved Oxygen in October 2018. The reason why we had such great results compared to some of the previous months is that we had a dry weather sampling day in October, meaning that the watershed wasn’t being polluted with stormwater rushing off of the streets. Stormwater is the biggest source of pollution we face within the Neponset Watershed. When it rains, everything that is small enough to fit into storm drains that is on the street will be picked up by the rainwater and will discharge into the nearest body of water. This can cause extremely poor water quality and can be harmful to aquatic life and humans alike. Now that the sampling season has come to an end, we will be looking a little more closely at the data and we will be working to improve our CWMN program for next year. Thanks again for everyone who plays a role in making this sampling program possible! first runoff protection I have seen in Sharon for the creeks. As you go down the path at Deb. Sampson St. and Billings and walk a little bit there is a smallish pipe draining water from under Billings St. into a tiny creek that feeds into the main creek and lo and behold there is now a u shaped netting filled with straw right were the water drains into the little creek. This is not the large pipe that carries the water under Billings into a section of the brook, but further down the path.